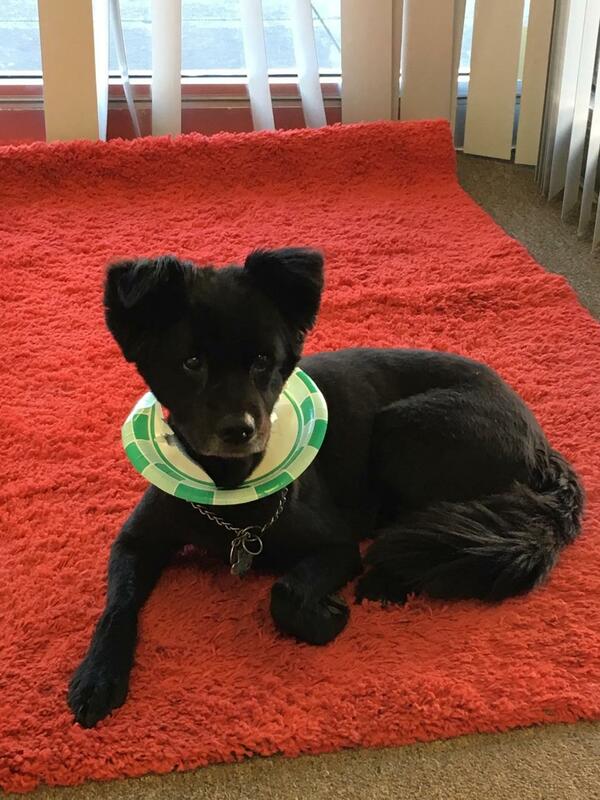 Square 205 is a digital creative agency full of awesome people, but our pets are even cooler. If you’ve ever stopped by our office, you have likely been greeted by one (or more) of our furry friends. As a gift from our family to yours this holiday season, here are some adorable pictures and profiles of our four-legged best friends. What else could you want for Christmas? Kirin belongs to our CEO Paul. Although she looks like the youngest of all the pets in our office, she is actually 12-years-old. Paul adopted Kirin when she was just a puppy, and named her after Kirin Ichiban, a Japanese beer. She is very furry and can turn your carpet black, but when her owner gets her shaved she looks like a little lamb. 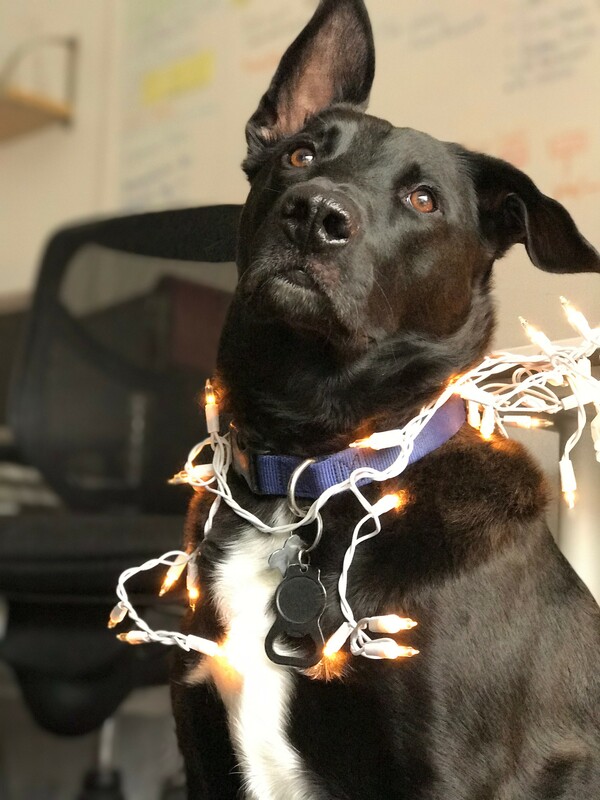 Don’t let her title of CFO intimidate you, Kirin’s super sad puppy-dog eyes and friendly personality make her a joy to work with in the office. She also helps with boosting morale with her crazy awesome high-fives. When Kirin isn’t in the office CFO-ing, she enjoys trying to drive Paul’s car and investigating mysterious smells. Every now and then she will seek out a critter (such as the neighbor’s chickens) to revert back to her wolf-like instincts and bring Paul a “gift,” because she’s just that sweet. As Director of Cuteness, Yara visits everyone’s desks to ensure they have met their cuteness quota for the day. When Yara isn’t exploring the office, she enjoys sleeping, running in circles, cuddling and attacking the ankles of her owner, Helen. Luna is our Producer, Charles’, frisky Miniature American-Eskimo. Luna was adopted roughly 6 years ago, and named after Luna Lovegood. Her favorite movie is Mean Girls, and her favorite trick is twirling. Luna takes her job as Head of Security very seriously. She can often be found in the front room of the office sitting in a chair, watching anyone who walks by our window. 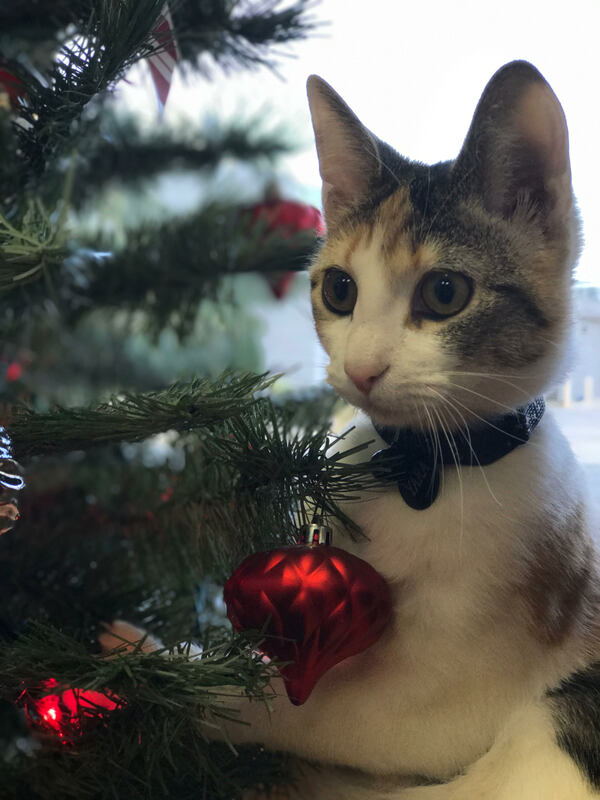 When she’s not watching out the front office window, she can be found watching the office from a cubby shelf or keeping people’s chairs warm when they leave their desks. When Luna isn’t protecting our office from evil, she enjoys hiding under her owners’ couch and practicing controlling her bladder. Much is our Copywriter Krystal’s 3-year-old pup. He was named after “Much the Miller’s son” from Robin Hood, and brings energy into the office every time he visits. His favorite trick is “Meerkat,” and his favorite toys are his squeaky tennis ball and his (almost destroyed) duck. 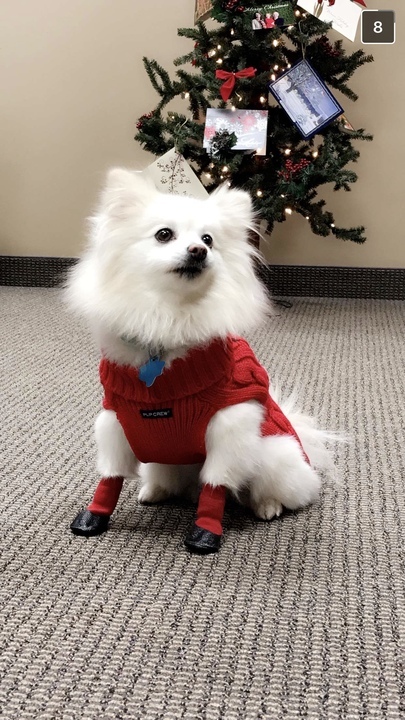 As Manager of Distractions, Much often wanders around the office looking for people to pet him, and hopefully feed him human food. His favorite thing about coming to the office is having people feed him ice cubes when they walk to the freezer. When Much and his adorable ears aren’t in the office, he can be found sleeping on his giant turtle bed, or chasing squirrels and rabbits. The “Developer Dogs” all belong to our Lead Web Developer and Project Manager, Jim. 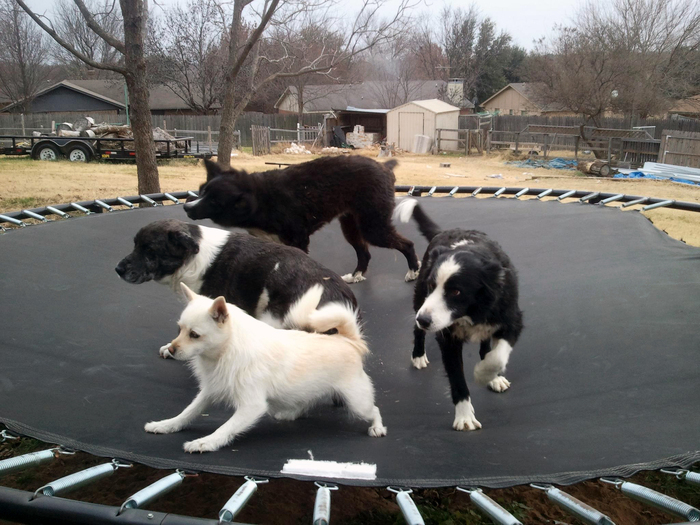 Z, the oldest of his comrades, is a purebred Border Collie. He is named Z because of the white “Z” he had on his head as a puppy. Z will turn 18-years-old in February, and although he used to enjoy swimming, playing frisbee, and herding everything insight (including Jim’s two human sons), his favorite pastimes are sleeping and cuddling. Inu is an almost 8-year-old White Terrier/Chihuahua mix. When she isn’t developing awesome projects, Inu can be found chasing and trying to kill anything that moves in the backyard. But don’t let that scare you, she’s super sweet and will drive you crazy with her love for attention and praise. Jim and his family rescued Sherman, the almost 8-year-old Catahoula Cur mix, from being put to sleep at the Denton animal shelter. Although he is a pretty big dog who weighing in at about 65 lbs, he is afraid of almost everything and has a sad Hound Dog look on his face. His hobbies include playing with his dog pack, and hanging out around the house. Stop By and See the Pets of Square 205! Want an excuse to see these cute faces in person? Have Square 205 help you with any digital marketing needs! Stop by, get your face licked, and let’s talk!